I’m sure Bob wishes he could have written this post, as it follows up on a story which, for quite a while, it seemed as though he was the only one following. Briefly: Marine Pvt. 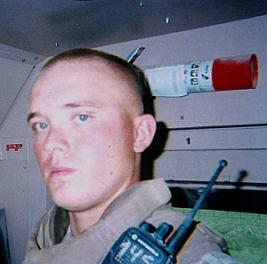 Travis Hafterson has been diagnosed with PTSD — post traumatic stress disorder. He left the Marines to seek treatment in Minnesota, and was set to be voluntarily committed to a mental health facility. The Marines got to him first and he’s currently in the brig in Camp Lejeune, N.C. The Marines had not commented on the Hafterson matter beyond confirmed that he was in their custody, until today. Here is the full text of a statement from Marine spokesman Maj. Kelly Frushour. In late September and early October there was a spate of reporting by news agencies in Minnesota regarding the case of Marine Pvt. Travis Hafterson. Much of this reporting centered on Hafterson’s claims of suffering as a result of his deployments to Iraq. Marines are trained in and abide by the Law of Armed Conflict and take any violations of these laws seriously. After reading statements in these news stories which alleged law of war violations (the alleged killing of a wounded Iraqi), the Marine Corps investigated the claims. Hafterson was not present when a lieutenant in his command was wounded. Hafterson did not engage in any combat while deployed. Hafterson did not kill anyone while deployed. Hafterson never fired his weapon while deployed. Hafterson does not have a Combat Action Ribbon. When returning from a deployment, Marines undergo a post-deployment health assessment. This assessment is an inclusive review of a Marines’ combat experiences, living conditions and environmental exposures while deployed. help Marines, Sailors and their family members. MPR’s Elizabeth Dunbar has the full story of today’s response from the Marines, including reaction from Hafterson’s side. Pvt. Hafterson’s attorney, Ron Bradley, said Thursday that he was “surprised and skeptical” of the Marines investigation, noting that a psychologist and psychiatrist in Minnesota had both found that Hafterson suffers from PTSD. Bradley also said Hafterson was part of an infantry unit, which he said makes it likely that he engaged in combat. Newer › Does Obama deserve the Nobel Peace Prize? But they don’t say if he has received any medical attention or has had access to his family. I don’t believe them. Sorry, Too many lies about this war means I don’t trust them. And I spent fifteen years as an Army dependent. Once again I am dismayed at the treatment our service members receive after they come home. Whether Pvt. Hafterson was actively in combat or not does not preclude him from having PTSD. PTSD is not only caused by being in combat; it can be triggered by any mentally traumatic situation. I suffered PTSD due to a traumatic situation with my daughter nearly being murdered when she was only an infant. I struggled with it for years, but finally after therapy, I was able to face the situation and am much better able to deal with the memories. Being in a combat zone, with imminent danger present at every moment of your life must be extremely mentally stressful. Pvt. Hafterson needs our compassion and he needs mental health support for a diagnosed condition. Why can’t the military just do what is right? He is just another Number! Believe the military, please no way! I have heard of people getting PTSD from listening to first-hand accounts of stories, where people empathize a little too much and take someone else’s trauma on themselves. It is possible that, if Pvt. Hafterson was really not in active combat, that he could still have PTSD in hearing other service members’ stories from combat. However, I do believe that he was in combat, and I’m not sure why the Marines would lie about this…..
Why would the Marines lie? To save face, obviously. No one wants to know that these wars are freakin stupid and pointless. If no one needs killing than there is no job security for the military. These young people enlist thinking they can handle the efects of war. Maybe some do. But who is any one to say how they will handle it emotionaly after it has become a reality. The ones that claim they are hoorah tough .Are they truly the same as they where before they went in? Reguardless Travis put his life on the line believing it was the right thing to do.No one one knows what the human soul can take until faced with its perils.He should not feel ashamed for what he has endured. The real shame is not giving our young soldiers the acclaim and help if they need it.Before we have another casualty of war due to his own hands.I would like to know what the suicide rate is of those that have claimed this hoorah status.